Healthepic-Premature ageing and its causes according to Ayurveda. According to Ayurvedic ideal, old age starts long after one has passed his seventieth year. It is however, the general experience at present that a man starts growing old from forty onwards. Old age is a slow and continuous process of physical deterioration in strength, in energy and in initiative, and cannot meet the requirements of an active life. That is composed of sesame sweets and starchy foods. Generally eaten before the food taken previously is digested. Habitual over-excitement of the mind due to fear, anger, lamentation, greed, insensibility and exertion. According to Caraka all the physical defects of a chronic type can be corrected by a process that was not only successful in the case of Gods, but also proved equally effective in the case of human beings like Cyavana Maharsi and many others who obtained with it youthfulness again and were able to gain the love and amour of their beloveds. Vibvabhesaja, along with-hot water due to which the person purges several times. Food should then be given, composed of barley and ghee, for about seven days so that all the old faeces are discharged. Now the Rasayana process can be administered. The Rasayana process should be undertaken before a man reaches his twenty-fifth year, or at least before he has completed his fiftieth year, as thereafter it is not quite as effective. The Kutipraveshika process requires a special hut to be built specially for this purpose. This hut consists of three similar huts, one inside the other, with small doors and windows on opposite sides of each other. The innermost hut gets no air or sun's rays and resembles the womb of a pregnant woman. 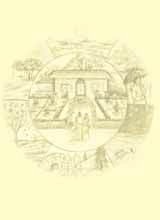 The person who has been purified in body, as mentioned above, should stay in this innermost hut, for a period required for the proper effect of the medicine. This is generally about four months and may extend even to six months. He has nothing else here to do except taking the medicine and following the instructions given by the attendant. He needs to concentrate his Mind on the expected results of the medicine. Many medicinal formulae have been given for this process. These are very difficult to prepare by persons under the present-day circumstances. Moreover if there is any mistake in the implementation of the method then there is a likelihood of untoward results. Hence this process does not appeal to an ordinary man. The other process are much better to follow. Health and Longevity are certain to follow, if the rules of maintaining health, as given in Ayurveda, are strictly followed.